The 2014 IDA Survey shows that one-third of senior citizens are using their smartphones to access the Internet, a 19 percent increase from 2012. Nowadays, it is common to see people in Singapore possessing smart gadgets. Board a bus or take the MRT, and most commuters have their eyes glued to their phones, especially the young. And senior citizens are also swept up in this technological wave. Recent surveys have shown that there is an increase in the number of senior citizens, defined as those who are aged 60 and above, using computers and smartphones. According to the 2014 IDA survey on household and individual usage of computer, the percentage of this group of senior citizens is 27, a 15 percent increase from 2012. And their Internet usage is 31 percent, up from 16 percent two years back. The IDA survey has been conducted for many years, with the intention of assessing the adoption of info-communications by resident households and residents in Singapore. In addition, the survey also shows that one-third of these senior citizens are using their smartphones to access the Internet, a 19 percent increase from 2012; this group of seniors obtained their technology knowledge from family members. The growing trend in smartphone adoption among the elderly does not come as a surprise, as global surveys such as Consumer Barometer and Deloitte’s Global Technology, Media and Telecommunications (TMT) have revealed that in general, Singapore has one of the highest numbers of smartphone penetration as compared with other countries. The Consumer Barometer survey also analysed commonly used smartphone functions – the alarm clock and photo/video. When using the Internet, most people use search engines. So what propels seniors to embrace or shun technology? We look at some common reasons. Some seniors are picking up smartphones to connect with their children and grandchildren, especially if some of their family members are working or studying overseas. In order to stay in touch with them, they start using these gadgets to keep themselves abreast of their family members’ lives. Of course, this is not limited to staying in touch with family members who are overseas. These days, many seniors and their friends are using instant messaging apps such as WhatsApp, LINE or social media like Facebook to stay connected. Mdm Teo, 64, is one such user: “I use WhatsApp to contact my family and friends.” However, although she has a Facebook account, she dislikes using it and prefers WhatsApp. Of course, there are also those who play games on their phones while travelling on public transport. Some of them play games to kill time. 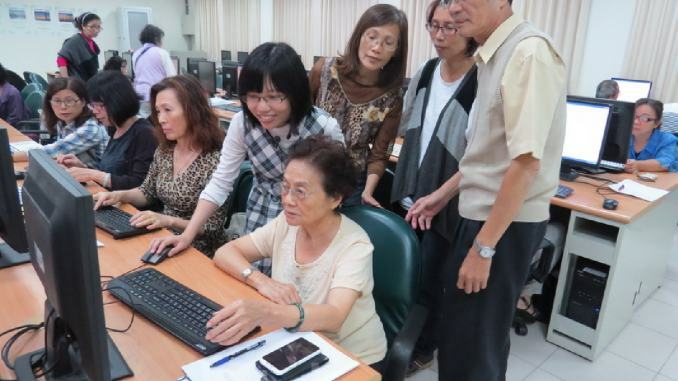 However, in a focus group jointly organised by the Smart Nation Programme Office (SNPO) and RSVP Singapore in January 2015, some seniors expressed their worries about the usage and complexities of modern technologies. According to RSVP Singapore, the aim of the focus group was to gain insight into the needs of senior citizens on their mobility, connecting with friends and family and their home environment. Some of the participants proposed having one-touch smartphone applications that can cater to their needs as most of the applications are usually complex and have many procedures to follow. Mr Vincent Liang, 60, agreed that the functions should be simplified: “There are too many procedures to remember when navigating a mobile application.” As a result, although he owns a smartphone, he does not frequently use these mobile applications. The president of RSVP Singapore also mentioned during the focus group that it will be a challenge to reach out to illiterate senior citizens. Hence, senior-friendly applications are required to help them. An online article published in Sina Tech by a Chinese blogger, Huang Jingyang, voiced his challenges of teaching his illiterate mother how to use a smartphone. Through teaching his mother, he realised phone designers should have designed mobile applications according to elderly needs such as having simplified operations, on top of just having SOS buttons and large font sizes. This is particularly pertinent with our ageing population, in which one in four Singaporeans will be aged 65 and above by 2030. In addition to designing senior-friendly applications, IT courses have been made available to senior citizens to help them keep up with technology. Seniors can enroll themselves and upgrade their skills in this area. As part of the Smart Nation Programme launched in end March this year, such courses are now available in some community clubs. By the end of this year, these courses will be available in all community clubs. SkillsFuture credits can also be used to offset the course fees. The purpose of having such courses is to encourage seniors to pursue lifelong learning.